Topological defects in space may have developed fractions of a second after the Big Bang. Simulations of these wormlike entities and a comparison of the simulations with cosmic background radiation measurements by the Planck satellite should confirm their existence. When Martin Kunz, a professor in the Cosmology Group at the University of Geneva, and his team at the CSCS commandeer "Monte Rosa", they mean business. Hardly any other computer job gets a look-in on the CSCS supercomputer as it works to ninety per cent of its capacity. At least this is what the Life graph on system usage reveals. Hardly surprising when you consider that the scientists are looking to simulate a particular moment in the origin of the universe when complex mechanisms and all manner of scales played a key role: the point when topological defects, so-called "cosmic strings" to be precise, might have formed. Topological defects are a common phenomenon in solid-state physics: if an area of a crystal does not undergo the phase transition, in other words reorganisation in the crystal lattice, during crystallisation, a topological defect develops in the lattice. To put it simply, in cosmology topological defects are supposed to form where a phase transition occurs in the universe. This was supposedly the case a few fractions of a second after the Big Bang. The phase transition caused different basic states to develop in different areas of the cosmos. 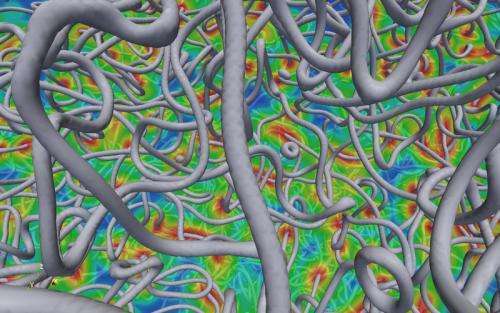 Wherever the different field conditions ultimately met, topological defects such as cosmic strings were able to form. They are supposed to be less than a trillionth the size of a hydrogen atom in diameter and quasi one-dimensional – "quasi" because, despite their defined one-dimensionality, they supposedly extend through space almost infinitely and as extremely thin "worms". In theory, these worms weigh about twenty per cent of the Earth's mass per kilometre in length. Kunz already examined topological defects in his dissertation under Geneva cosmology professor Ruth Durrer, where he endeavoured to use them to explain where the fluctuations one sees in the cosmic background radiation and out of which structures such as galaxies or galaxy clusters develop come from. However, his and other studies revealed that this does not work. "After that, topological defects were dead and buried in cosmology for a while," says the Geneva professor. It was not until cosmic inflation models became ingrained in the theories of particle physics that cosmologists began to focus on cosmic strings again. "People realised that cosmic strings are mostly produced when inflation is integrated in standard particle physics," says Kunz. "The existence of the defects can thus be motivated far more effectively with inflation." During the inflation phase, the young universe is supposed to have expanded extremely quickly at an exponentially increasing speed. In the models used, the phase of rapid expansion mostly ends with a phase transition that also leads to so-called symmetry breaking. Here, the basic forces of the strong and weak interaction and the electromagnetic force are supposed to have split into forces acting separately. According to the so-called Grand Unified Theory (GUT), these three basic forces had previously manifested themselves in a single force. In their models, Martin Kunz and his team simulate cosmic strings during this phase transition. After all, it provides the ideal conditions for producing detectable cosmic strings as, at the time of the GUT symmetry breaking in the universe, an incredibly high energy level of 1016 gigaelectron volts prevailed – one billion times more energy than the large hadron collider at Cern can generate. According to the researchers, at such energy levels the defects are so strong that they should be detectable. To detect the cosmic strings, the team thus simulates their location and distribution in different field conditions and measures their energy density. The results of the simulations are channelled into a programme that calculates the corresponding fluctuations in the cosmic background radiation using linearised equations. By comparing the results with the cosmic background radiation data, which the Planck satellite supplies during its mission, the researchers are hoping to be able to confirm these unusual defects. The cosmic background radiation may well only have originated 380,000 years after the Big Bang; however, it exhibits minimal fluctuations that, from what we know today, stem from the early universe. "If topological defects are present in the universe, they produce additional fluctuations that effectively contain a finger print of the defects and thus allow conclusions to be drawn as to their nature and origin," says Kunz. Martin Kunz's doctoral student David Daverio helped to improve the complex simulations significantly. In his Master's thesis, he completely rewrote the parallelisation of the codes used, which now means that the simulations can be carried out considerably more efficiently and a resolution that is sixty-four times higher achieved. This is an advantage for the researchers as time is of the essence. By 2014 at the latest, the results of the simulations need to be on hand so that they can be compared with the new Planck data. If the theories on the links between inflation, the formation of cosmic strings and the existence of a GUT are correct, this should be proved from the Planck data by then at the latest. Otherwise, once again it will be a case of excluding a model and trying to detect the supposed cosmic strings in another way – or bury them once and for all. Why are you researching cosmic strings? That's a good question (laughs)! It all came about because I did a doctorate under Ruth Durrer in Geneva, who just happened to be researching defects at the time. It was a nice area for me since it's physics you know exists in condensed matter and you can transfer it to the universe and look for it. I find it very nice physics. It's interesting and I just enjoy figuring out the simulations. As it's something that exists, you get the feeling that you're not doing something completely pie in the sky. The concept of topological defects has some bearing on reality. Whether cosmic strings do remains to be seen. What can cosmic strings explain in cosmology? Originally, we wanted to explain why all the structures were formed in the cosmos but we and other groups discovered that this isn't possible. Meanwhile, for us cosmic strings are more a by-product of inflation, through which we want to close in on inflation. If we found cosmic strings, we'd have the possibility to learn a lot about physics at very high energy levels. The energy levels at which these develop are many billions of times higher than those that even Cern can achieve or we will ever be able to achieve on Earth. The only way to research such energy ranges is cosmology. What uses could this research have? Cosmology and astrophysics are something that always interests the general public and students. Even though basic research like ours is a far cry from what you need on a daily basis. In the past, however, quantum physics à la Heisenberg or Schrödinger was also basic research. You could scarcely imagine what you needed it for. As cosmologists, we're really at the cusp of natural philosophy but, who knows, if we were able to explain inflation or find topological defects that revolutionised high-energy physics or explained dark energy, it could change physics to such an extent that we gain completely new insights. These, in turn, could well significantly change our lives much later. So you assume that confirming cosmic strings could change our view of the world. Yes, if we found cosmic strings, it would change and improve our understanding of the universe. If the discovery is consistent with an inflation model on a GUT scale, it would be the first direct test of something connected with inflation. We would thus reinforce the model. On the other hand, it would also reinforce the concept of GUT itself and presumably help to find out what exactly the symmetry groups that are relevant are. This would give us a much better idea of what high-energy physics looks like at energy levels much higher than those Cern can generate. At the moment, the standard model is incomplete. Until something new is invented, no-one really knows what is between the Cern energy and that of quantum gravitation, which we can't even describe. We're talking about a desert here as no-one exactly knows whether anything happens in this range. If we found a direct relic from the other side of the desert, it would be able to tell us far more about what lies in between. And what if we don't find this relic? Then we'd shelve a couple more models. But doesn't this put a question mark over the inflation hypothesis itself? The way I see it, once we've got the data from the Planck, surely we'll be able to confirm or reject almost all the inflation models that are embedded in a GUT theory in two or three years. Our scenario of inflation is a specific implementation in particle physics. We can't do without inflation as such because we haven't got an alternative. And this, folks, is how science is actually done. It is why some theories being expoused on this site are labelled crack-pot; the comment "it feels like it should be thus" means sweet FA to real science. It is also why some of the expousers are labelled crack-pot; to denigrate all scientists because they won't accept your so called epiphamy makes you the fool, not them.